Happy New Year from 100PLUS! 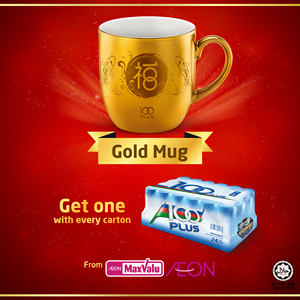 Usher in 2017 with our collectible 100PLUS Gold Bowl and Gold Mug premiums when you purchase one carton of 100PLUS Original Cans at selected stores (while stocks last). 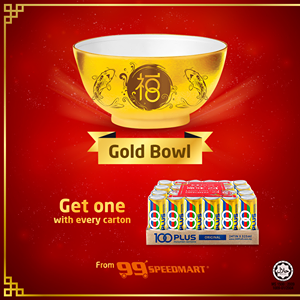 This year, celebrate a Golden Chinese New Year as 100PLUS brings you prosperity and happiness with Limited Edition 100PLUS Original Gold Cans, 100PLUS Original Gold 1.5L Bottles, Gold Bowls and Gold Mugs. Welcome more Golden Fortune into your home with these gold items and delight in a prosperous and golden celebration. 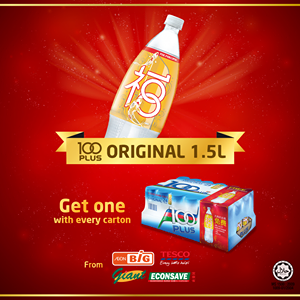 Get your favourite gold items at selected outlets with every purchase of Limited Edition 100PLUS Original Gold Cans (1 carton). Visit your nearest participating outlet and buy one today! *Visuals shown are for illustration purposes only. While stocks last.